Finding the right 24-inch beverage center can be tricky. It is a standard size, with a multitude of options to choose from- each with varying degrees of quality, and that is before you even get into the different features offered. But if you are planning on installing a beverage center into your under countertop space, the 24-inch variety is the way to go. Part of finding the right product is knowledge- knowing what you are looking for, and what you are willing to spend. Are you looking for a straightforward beverage station for soda, juice, and snacks? Will this beverage station be keeping wine or beer? And if so, are there little ones around? How safe does it need to be? How reliable? In this article, we tackle all of these questions, and present a variety of 24-inch beverage centers that will give you the straightforward answers you want, while providing you with a snapshot of what the best looks like. The Avallon provides a great mix of durability and storage space at a price point lower than the competition. 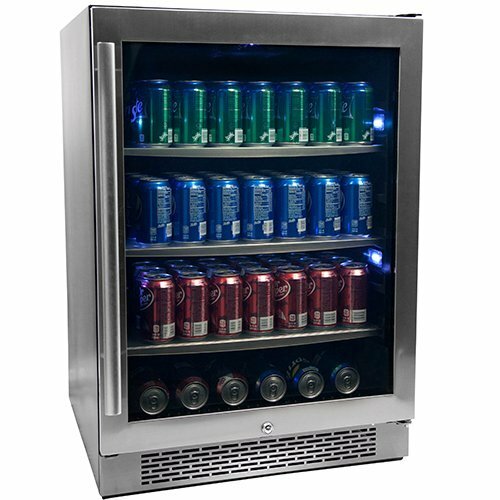 A single zone unit with a temperature range of 34 degree to 50 degrees Fahrenheit, this 24-inch beverage center uses compressor powered cooling mated with fan forced front exhaust located in the front of the cooler. Internal LED lights provide illumination of the three sanded glass shelves inside and their contents, while a True-key lock keeps the seamless stainless steel door secured. Perfectly sized, but heavy, we rate the Avallon Built-In Beverage Cooler 8.5 out of 10 for its combination of price, quality, and security. The Allavino 2 Door Dual Zone Beverage Center represents quality, aesthetic, and options in a bang for the buck form. This 24-inch beverage center features a dual zone feature that will allow you to keep each size of the beverage center at different temperatures. 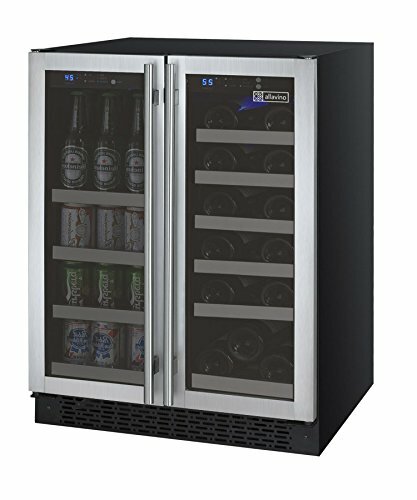 Ideal as both a wine cooler and beer fridge, you will be able to keep your white wine crisp and your beer as ice cold as you want, with a temperature range from the upper 30s through the low 60s. Temperature is set with digital LED controls for each zone, and runs off of an energy efficient cooling system that has been paired with fans for even and efficient air circulation. The wine side of this 24-inch cooler features six different racks that move on ball bearings for easy access, addition, and removal. On the other side of the beverage center, room for up to twenty-one 8-inch bottles and an additional eighteen cans is present, with the whole being sealed shut by French doors complete with smoked, double pane glass. This unit features a front vent for cooling, making the Allavino a straightforward installation in most under cabinet spaces, with minimal issue. The Allavino 2 Door Dual Zone Beverage Center features stainless steel, and this shows up in its weight, with the beverage center weight in around 140 pounds. Measuring 23 inches by 24 inches, the Allavino stands 33 inches high and is the ideal beverage center for any kitchen. I am high on Allavino, giving it a 9 out of 10 for its combination of dual zone cooling, stainless steel, and ample storage space within a quality package. The Electrolux Stainless Steel Beverage Center is a stylish mix of all of your favorite features in a 24-inch beverage center. Using integrated IQ Touch Temperature Controls to command the internal temperature, this 24-inch beverage center features polished stainless steel, and a door alert feature to warn you if it has been left open. Blue LED lighting provides ample illumination from the inside, with a black soft coat wire wine rack and two full extension glass shelves built in. The Electrolux is energy efficient, and measures 24 inches by 24 inches, with a height of 34 inches. Make no mistake about it, this is the big boy of the group and it has the price point and ratings to back it up. The Electrolux Stainless Steel Beverage Center is easily twice the cost of the Allavino, and while it is a very nice piece, one has to wonder if it is that much nicer. This is a tough question. Each of these beverage centers is of an excellent quality, and will serve you well for many years. With that being said, I prefer the Allavino Dual Control Two Door Beverage Center. I am a fan of the Allavino’s excellent size and versatility in proper beverage storage. The Stainless steel on wood is a classic design, and the ball bearing drawers glide with little effort. The added control you get from a dual zone is difficult for any single zone to compete with, but especially if the unit is very expensive. The French doors are a nice touch that will be complimentary to any kitchen, and its storage space cannot be matched by beverage centers of a comparable size. That’s all from us. We hope that you enjoyed reading, and wish you luck on your purchase! Cheers! A review of the Smad Freestanding Wine Cooler which has capacity for 35 bottles and various neat features. In the world of professional grade beverage centers, there are many options, but no one does it like U-Line. 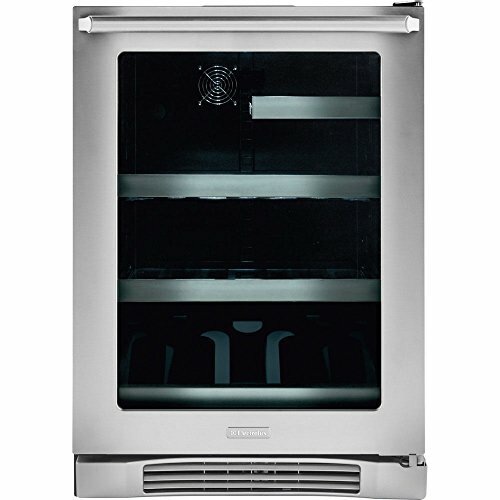 If you were looking into getting your first wine fridge, a Cuisinart would certainly be a great starting place. But what do you look for? If you are planning on installing a beverage center into your under countertop space, the 24-inch variety is the way to go. Here are some of the top models.